Last weekend didn’t work out as I planned it at all. While I did get quite a lot done none of it involved dyes or dye stuff. 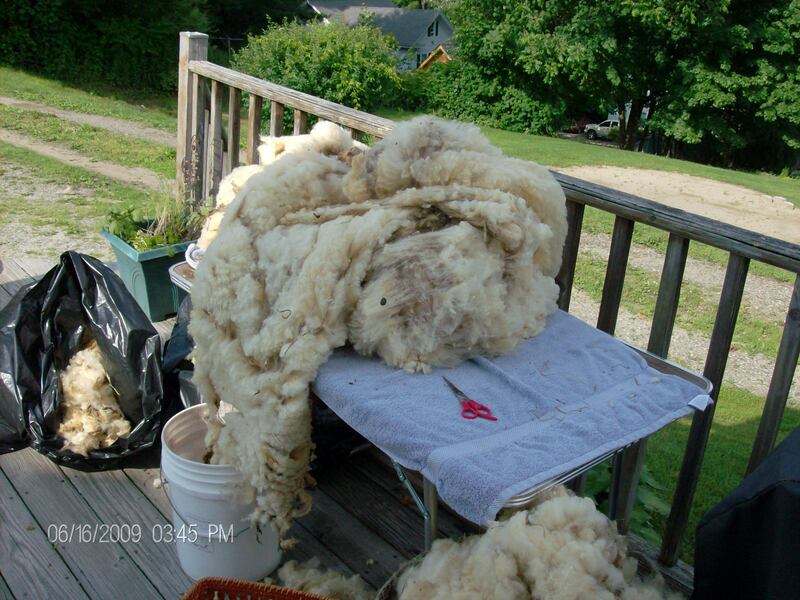 I spend the time washing fleece. It takes a while to do that and my arms were talking to me right up until Tuesday about all of the holding up of wet bags of fleece that they did. There are only so many ways that I have found to drain the wash and rinse waters out of the mesh bags and apparently I should be doing it more often. I’ll have to work on that one. My arms are happily agreeing. This was its first day here, not this past weekend happily otherwise I’d be farther behind myself than I am at present. There really is something, though, to seeing the wool clean up and feel the change in the texture once some of the lanolin is removed. Oh, and it doesn’t smell quite so much like sheep in the mud room anymore. It’s a good thing my significant other has a sense of humor. This will be the first of wool that I will have processed from fleece to final project and I’m rather excited about it. I think it whistles and whispers to me occasionally because I find myself standing by the basket when I was headed in a totally different direction. This could become problematic, but for now I’ll just take it in stride and see how it works out. I also have some spun yarn – not my spinning yet – to add to the dyeing pile. This will make some wonderful hats, I think, and I can’t decide if I should just color like a crazy person – taking notes all the while – or begin very methodically with a plan. Never having done this I know that there will be OMG moments, but I’m having trouble deciding which side of my brain to let take the lead. Any suggestions on this one? Excellent, I have just bought the dye powders and I have all the recipe’s for getting different colours. I am so looking forward to that. It is a lot of work to process a fleece isn’t it. It is! And it rather like watching paint dry. LOL. Do you have yarn to dye now? LOL. I love it. I would really like to see some of your results.